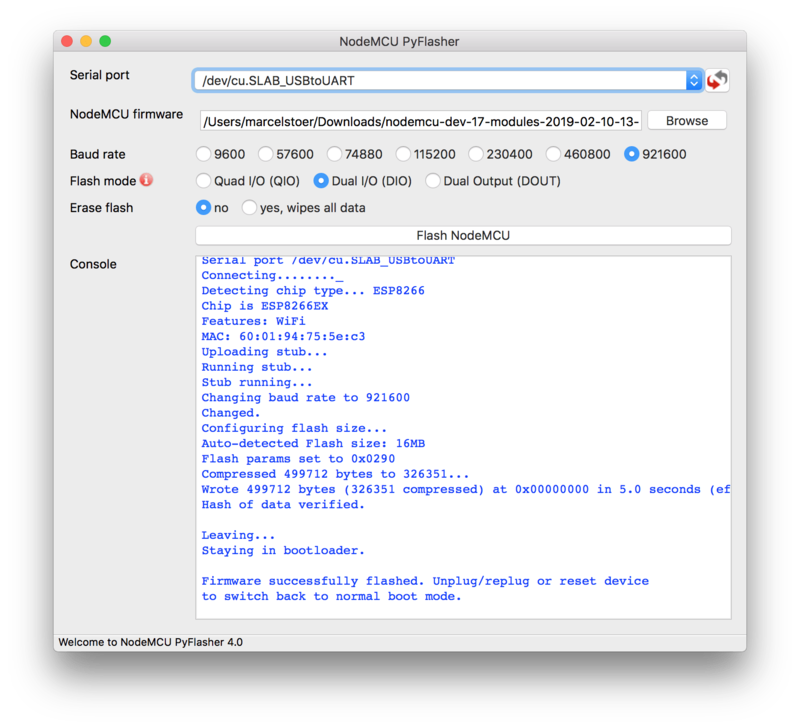 The basic process to get started with NodeMCU consists of the following three steps. Upload code to the device. You will typically do steps 1 and 2 only once, but then repeat step 3 as you develop your application. If your application outgrows the limited on-chip RAM then you can use the Lua Flash Store (LFS) to move your Lua code into flash memory, freeing a lot more RAM for variable data. This is why it is a good idea to enable LFS for step 1 if you are developing a larger application. As documented below there is a different approach to uploading Lua code. There's more than one way to skin a cat. For each of the tasks you have a number of choices with regards to tooling. The colored boxes represent an opinionated path to start your journey - the quickest way to success so to speak. Feel free to follow the links above to get more detailed information. Our intention is to introduce you to programming in Lua on the ESP8266 as quickly as possible, so we have kept the number of tools mentioned here to a minimum; frightanic.com: Tools and IDEs discusses other tools and options. The below chapters are not meant to be followed one-by-one. Pick a task from the matrix above and it will take you to the relevant chapter. We recommend using the floating point build, even though the integer variant uses less RAM for storing variables, as there is little runtime difference between the two variants. Furthermore, the floating point variant handles non-integer values properly and this greatly simplifies numeric calculations. For everything else the cloud builder GUI is self-explanatory. Hence, no need for further explanations here. Note that this service is not maintained by the NodeMCU team. It's run by a NodeMCU team member as an individual, though. Self-contained NodeMCU flasher with GUI based on Python, esptool.py (see below) and wxPython. A runnable .exe is available for Windows and a .dmg for macOS. No installation required on Windows and macOS! Instructions how to run it on other platforms are available on the project site. Install drivers for USB-to-serial. Which driver you need depends on the ESP8266 module or USB-to-serial converter you use. Connect USB cable to device and computer. Select serial port, browse for firmware binary and set the flash options. Note that this tool is not an official NodeMCU offering. It's maintained by a NodeMCU team member as an individual, though. esptool.py was started as a ESP8266 community effort but has since been adopted by Espressif. It's their officially recommended way to flash firmware to ESPxxx chips. Install either Python 2.7 or Python >=3.4 on your system if it's not available yet. The default baud rate is 115200. Most hardware configurations should work with 230400 dependent on OS, driver, and module. NodeMCU and WeMos modules are usually ok with 921600. More details available on esptool.py GitHub repo. Arguably NodeMCU-Tool, which requires Node.js, is the better code upload & execution tool than ESPlorer. Also, in contrast to the former it is very well maintained. However, we also understand that Windows users in general prefer GUI over command line. Note that you may need to use the sudo prefix to install the tool at step 2, and also possibly add the –unsafe-perm flag after the install command. The Docker NodeMCU build image is the easiest method to build NodeMCU related components locally on your preferred platform. Detailed instructions available in the image's README. As for available config options check the documentation and study the comments in app/include/user_config.h. In app/include/user_config.h edit the line #define LUA_FLASH_STORE 0x0 and adjust the size to that needed. Note that this must be a multiple of 4Kb. Note that this Docker image is not an official NodeMCU offering. It's maintained by a NodeMCU team member as an individual, though. A local copy of luac.cross is only needed if you want to compile the Lua files into an LFS image yourself and you are not using Docker. Windows users can compile a local copy of the luac.cross executable for use on a development PC. To this you need: - To download the current NodeMCU sources (this dev ZIP file or master ZIP file) and unpack into a local folder, say C:\nodemcu-firmware; choose the master / dev versions to match the firmware version that you want to use. If you want an Integer buld then edit the app/includes/user_config.h file to select this. - Choose a preferred toolchain to build your luac.cross executable. You have a number of options here: - If you are a Windows 10 user with the Windows Subsystem for Linux (WSL) already installed, then this is a Linux environment so you can follow the Linux build instructions below. - A less resource intensive option which works on all Windows OS variants is to use Cygwin or MinGW, which are varaint ports of the GNU Compiler Collection to Windows and which can both compile to native Windows executables. In the case of Cygwin, install Cygwin (selecting the Cygwin core + gcc-core + gnu make in the install menu). In the case of MinGW you again only need a very basic C build environment so install the MINGW; you only need the core GCC and mingw32-make. Both both these create a Cmd prompt which paths in the relevant GCC toolchain. Switch to the app/lua/luac_cross and run make to build the compiler in the NodeMCU firmware root directory. You do this by rning make in Cygwin and mingw32-make -f mingw32-Makefile.mak in MinGW. - If you can C development experience on the PC and a version of the MS Visual Studio on your PC then you can also simply build the image using the supplied MS project file. - Once you have a built luac.cross executable, then you can use this to compile Lua code into an LFS image. You might wish to move this out of the nodemcu-firmware hierarchy, since this folder hierarchy is no longer required and can be trashed. Ensure that you have a "build essential" GCC toolchain installed. Download the current NodeMCU sources (this dev ZIP file or master ZIP file) and unpack into a local folder; choose the master / dev versions to match the firmware version that you want to use. If you want an Integer buld then edit the app/includes/user_config.h file to select this. Run make to build the executable. Once you have a built luac.cross executable, then you can use this to compile Lua code into an LFS image. You might wish to move this out of the nodemcu-firmware hierarchy, since this folder hierarchy is no longer required and can be trashed. lua_examples/lfs/_init.lua. LFS helper routines and functions. lua_examples/lfs/dummy_strings.lua. Moving common strings into LFS. lua_examples/telnet/telnet.lua. A simple telnet server. lua_modules/ftp/ftpserver.lua. A simple FTP server. You should always include the first two modules, but the remaining files would normally be replaced by your own project files. Also remember that these are examples and that you are entirely free to modify or to replace them for your own application needs. Upload a ZIP file with all your Lua files ready for LFS. The webservice will cross-compile them into a .img ready to be uploaded to the device. It supports LFS images for both floating point and integer firmware variants. Further details available on the service site. The same Docker image you used to build the NodeMCU firmware can be used to compile Lua files into an LFS image. For Windows you will do this from within the WSL / Cygwin command window, both of which use the bash shell. You will need to adjust the img and lua paths according to their location, and ensure that luac.cross is in your $PATH search list. For example if you are using WSL and your project files are in D:\myproject then the Lua path would be /mnt/d/myproject/*.lua (For cygwin replace mnt by cygwin). This will create the lfs.img file if there are no Lua compile errors (again specify an explicit directory path if needed). You might also want to add a simple one-line script file to your ~/bin directory to wrap this command up. The compiled LFS image file (e.g. lfs.img) is uploaded as a regular file to the device file system (SPIFFS). You do this just like with Lua files with e.g. ESPlorer or NodeMCU-Tool. There is also a new example, HTTP_OTA.lua, in lua_examples that can retrieve images from a standard web service. Once the LFS image file is on SPIFFS, you can execute the node.flashreload() command and the loader will then load it into flash and immediately restart the ESP module with the new LFS loaded, if the image file is valid. However, the call will return with an error if the file is found to be invalid, so your reflash code should include logic to handle such an error return. LFS is now in the require path, so require 'myModule' works as expected. Do a protected call of this _init code: pcall(node.flashindex("_init")) and check the error status. See Programming Techniques and Approachs in the LFS whitepaper for a more detailed description.